The Amazigh people are strongly stuck to their ancestral traditions through keeping their customs vivid and alive from generation to another. 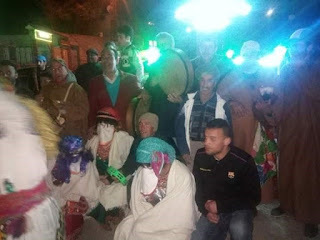 As an evidence, they celebrate almost of their Berber heritage and traditions each year till nowadays. Among those sacred traditions that still exists till now is "Bouafif "or "Amghar Waqrouche" which is celebrated each year on the first day of spring (1first of March) in the Berber calendar. The first of March, for the Berbers, is the entrance of spring which means the entrance of happiness and fruitfulness. This day is marked by preparing a special meal called "Adhries", a dish that goes back probably millennia. It is couscous steamed with a medicinal plant called "Thapsia", Adheries in Tamazight. The night of this day is culminated by enjoyments via a very ancient custom which resembles the American Halloween, to some extent. 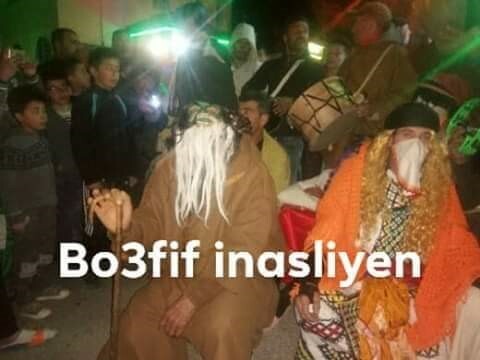 Instead of the scary clothes and scenes in the American one, the Berber Halloween tries to provide joy among people. I am talking about "Bouafif" which is an ancient Kabyle practice or tradition bequeathed by their ancestors .This tradition consists of forming a group of villagers (young males or children) to compose musicians and dancers disguised as women or old man and who go from door to door to collect eggs, sweets, money,… for a fun .The sounds of flute and "bendir"(tambour) accompany them. Whenever the group arrives in front of a house, the inhabitants open the door after hearing the phrase "Ekker adyeskker rebbi saad-ik, Amin" (Wake up and God will blow the luck in your home, Amen). 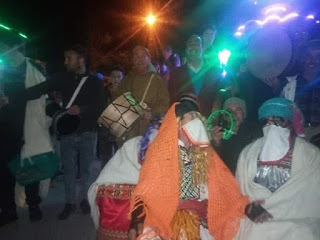 As a symbol of gratitude for these moments of happiness, locals offer treats and eggs to them after enjoying their dancing and beating on the tambour to compose rhythmic sounds. It is a custom that never dies since it belongs to the Amazighs. It is the Amazigh way to say good bye to winter and welcome to spring with delight.